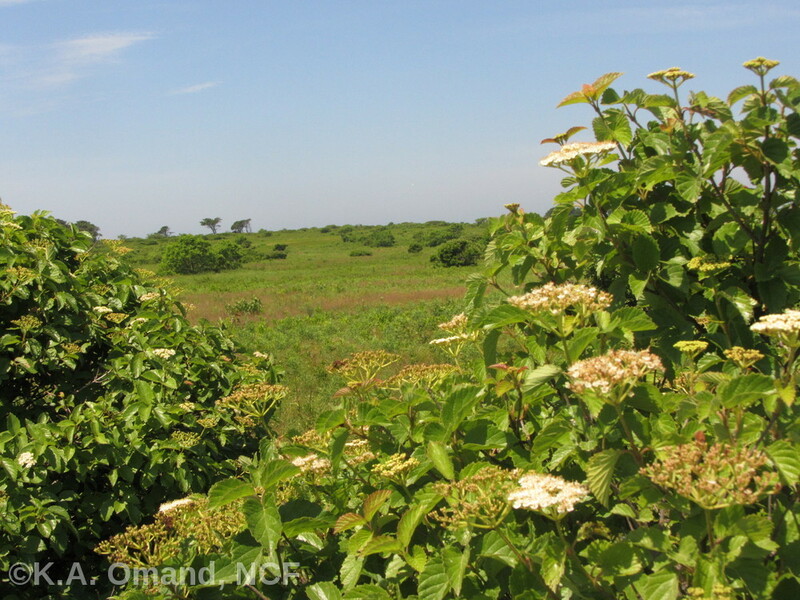 Every year in midsummer, Nantucket’s conservation lands and roadside shrub thickets are suddenly abloom with lacy cream-colored flowers that resemble Queen Anne’s lace. Most of these flowers belong to arrowwood (Viburnum dentatum), one of the most common and important of the island’s shrub species. While this shrub typically grows in areas with moist soils and along pond shores, on Nantucket it can also frequently be found rubbing shoulders with bayberry and roses in our coastal heathlands, battered by salty sea air and wind, but tolerating the tough conditions. Arrowwood does have a sworn enemy: the introduced viburnum leaf beetle (Pyrrhalta viburni). The beetle made its first North American appearance in Ontario in 1947, expanded as far as New York State by 1996, and reached Massachusetts by 2004. Each season since I moved here in 2008, I’ve been keeping an eye out for the characteristic leaf damage of this beetle, and each year breathed a sigh of relief when I didn’t encounter it. In Maine, I’d been horrified to watch it skeletonize arrowwood, highbush cranberry, and nannyberry. The viburnum beetle was likely originally imported on a cultivated European or Asian viburnum bush, and has had an unwitting helping hand in its spread throughout the northeast via nurseries and garden centers. North American viburnums didn’t evolve with this beetle, so they never developed chemical defenses to deter these particular insects. 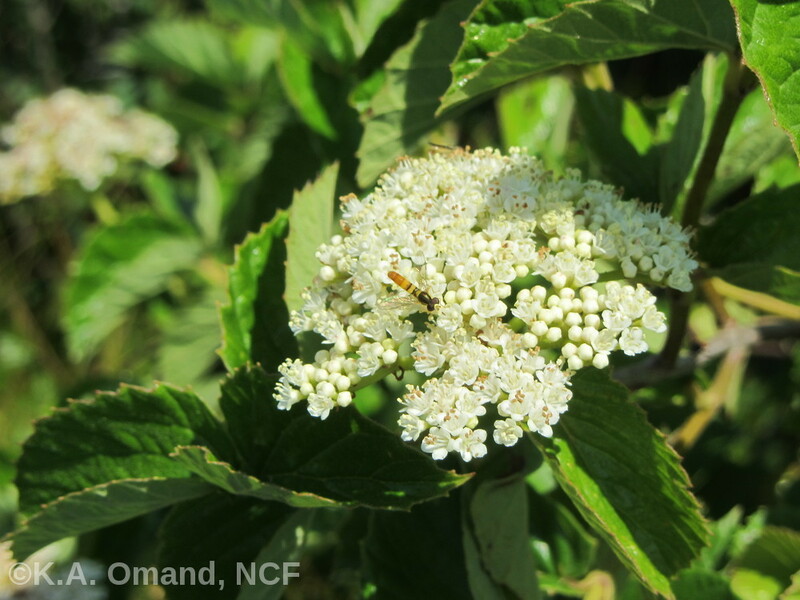 Since they started their search for another elusive viburnum bark mining insect in September of 2011, Charley and Julia have been keeping a close eye on Nantucket’s arrowwood populations. 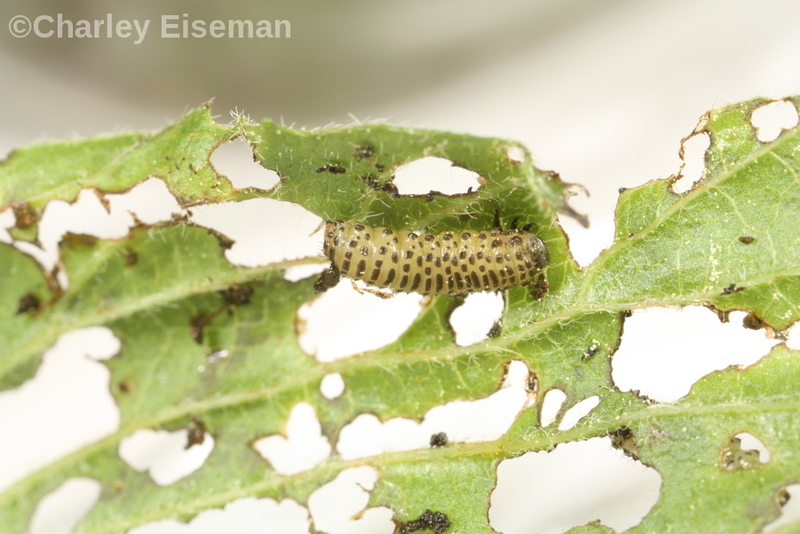 The larval mines (empty spaces left behind as the larvae eat their way through the interior of plant parts) they found in both the leaves and bark of arrowwood revealed an entomological mystery. The task of identifying a mining insect can require a lot of detective work and patience. In this case, it included overwintering the larvae so that they could emerge as adults the following spring. For the viburnum bark moth, the process took five years from the time they first spotted the bark mines here on island, to getting live moths to emerge to begin the process of identifying the adult insects! What can we expect when a new insect arrives on a small island like Nantucket? Our local plant communities are definitely unusual, so the impact may be different here than elsewhere. Islands frequently have fewer species compared to the adjacent mainland, and species you’d expect to be common are sometimes conspicuously absent. Conversely, species that are rare on the mainland are often abundant on Nantucket, due to differences in the environment and past land use. Since arrowwood is so widespread and common on Nantucket — with high food value for birds and insects — we suspect that the spread of the introduced leaf beetle across the island may lead to dramatic changes. Winterberry holly, pepperbush, highbush blueberry, and swamp azalea are all likely to fill empty spaces if the arrowwood declines rapidly. But invasive non-native shrubs like bush honeysuckle (Lonicera morrowii) and autumn olive (Elaeagnus umbellata) could also rapidly gain a foothold in new areas of the island that are currently dominated by natives. Sometimes plants can survive in reduced numbers and gradually evolve protective mechanisms, like toxins that deter herbivores. It’s possible that Nantucket might be home to some disease or high populations of predatory insects (like parasitoid wasps) that will keep beetle populations low, or maybe our salty sea air will limit where it can thrive. Unless these scenarios play out, we can expect beetle populations to initially explode as they have elsewhere in New England. Let’s hope that something will help keep the viburnum beetle from taking a big bite out of our island ecosystem! 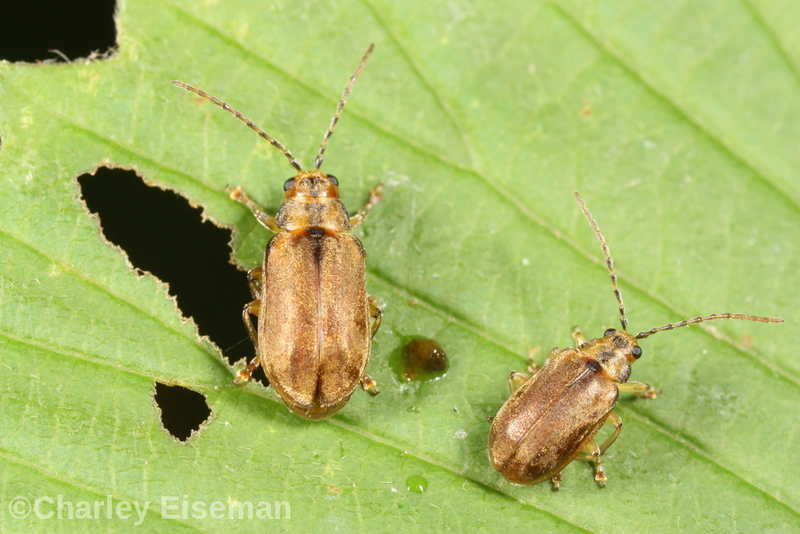 More info on how to identify viburnum beetle is readily available online, along with info about how to manage it in your yard. 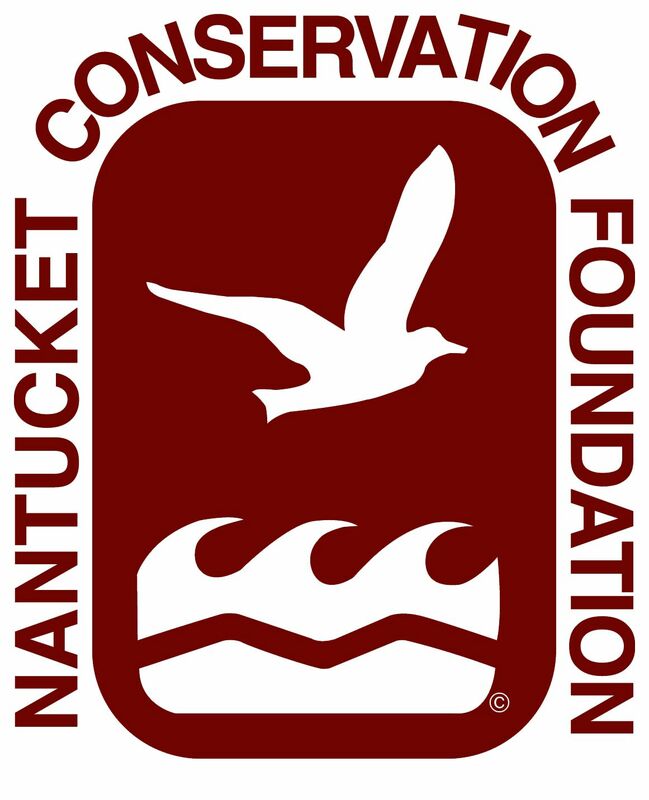 Kelly Omand is a botanist and an Ecologist/Field Supervisor with the Science and Stewardship Department of the Nantucket Conservation Foundation. Insect photos included in this article were contributed by naturalist and author Charley Eiseman — follow his explorations of the insect world (including his ongoing Nantucket research) in his “Bug Tracks” blog (http://charleyeiseman.com/).